What is trader moni Nigeria? This is one of the free loan scheme in Nigeria. And talking about free loans un Nigeria especially in Lagos, there is so many opportunities for our entrepreneurs. Trader moni organized by bank of industry is just one of them. The current Nigerian president and vice president has deemed it fit to give back to he society. This money will actually be paid back . What I mean is that if you collected 10,000 naira you will pay it back with a little interest within a specified time. Then they will give you a loan of 20,000 naira. This continues and the last cycle is 50,000 naira loan . Read on to get more news about the bank of industry loans. The federal government through the Bank of Industry (BOI) and Government Enterprise and Empowerment Programme (GEEP ) started this scheme to let people receive free loans. From what I’m seeing if this administration continues even after the 2019 election , it will likely receive lots of publicity and will move from what it is now (a mini programme to a large scale programme was part of the federal government’s social intervention aimed at funding micro business in the country. The vice-president said that the ‘Trader Moni’ programme will help in increasing micro and small scale businesses, and enhance the general GDP across the nation. You will be given a loan of 10,000. 10,000 for six months is more than ok to be repaid if you know what you are doing trust me. Even if it is pure water that you decide to sell with this money . you know that you can easily sell 10,000 naira worth of pure water can even be sold in a month. So do the math yourself. This is just an example for you to believe that six months to repay is more than enough for the trader moni boi project scheme. Who is the Trader Moni BOI projects Nigeria : registration and application for ? who may apply? According to him, “this scheme is targeted at petty traders, with market women, then artisans and small scale business units to cater for very small-micro enterprises. Some people may be skeptical that this sceme will only be temporary.well as with other policy of the federal government, we will just keep our hands crossed and see what will happen. It may last and it may not last but be ready to profit. How many people will benefit? 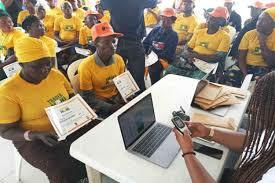 They are targeting about 300,000 thirty thousand beneficiaries. This is quite a large number. About 800 persons from each state . so you will definitely make it. I will advise you to get a bank account with popular bank in Nigeria like GTbank or better still open the same bank with your agent in any state you are. What I mean is that when the agent has the same account with yourself , the process will be easy so you can ask them first anyway. Do you need any document? “Under ‘Trader Moni’, traders don’t need any documents or property to collect N10, 000 loan from the federal government. This is actually 250 naira on 10,000 naira . So if you have ever been turned away by banks or friends then hang on this may be the break you have been waiting for. Trader moni agents in Nigerian statesLAGOSKANOBAUCHIYOBEOSUN and Anambra , Enugu Kebbi, Sokoto etc. I cannot visit all states but there are mobile money agent in so many states so ask and move out. Do you have any more questions? Are you thinking if this money is for you? Yes you can go fir it. But do your research of what to do with the moni before it arrives. This is the most important part. Do not be afraid to apply for the Trader Moni BOI projects Nigeria . take this step.